LaRedoute, France's #1 online clothing retailer, have just launched a new section to their UK website. Always noted for their fashion flair, we found that this collection surprised us with how good the value is. Their plus size menswear is best found by clicking on the PLUS-SIZE button in their top menu, not the menswear button. Then click on MENS at the left hand side. Lots of clothes right up to 75" chest. The brand with the biggest sizes is Taillissime, with large clothes from Timberland, Merrell, Columbia, Nike, Labonal and Adidas too. 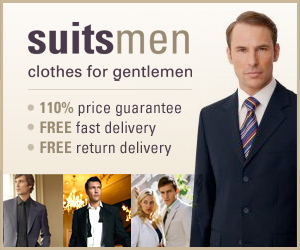 SuitsMen (uk) have been retailing on the net for 6 years. Jackets to 58" chest, and trousers to 54" waist. Now you have your chance to buy quality British tailoring direct. The price shown is what you pay. FREE delivery, FREE returns, FREE re-delivery if ordering a different size, and a 110% of the difference price guarantee if you find the same item online cheaper. Big Tee Shirt (uk) - run by outsize people for outsize people. Big Tee Shirt supplies cheap and inexpensive shirts, sweatshirts, jeans, belts, braces, socks shorts and underwear for the bigger person in the UK , to size 8xl. Swagger and Swoon have everything you need, not just in ties but in other accessories - plain and fashion ties, extra long ties, bow-ties, cravats, cummerbunds, wedding ties and novelty ties. They also have cufflinks, scarves, handkerchiefs etc. to add that 'final touch'. Chums has those hard to find high waisted trousers that are popular with older men, and stock large waist sizes up to 54" and inside leg lengths frm 27" to 33". Discreetly elasticated waisted trousers are extremely popular too. All at bargain prices. Chums also sell outerwear, underwear, nightwear and footwear. TESCO carries a range of the latest mens clothing staples, at their usual low prices. Sizes up to 3xl for tops, 50" ( or 127cm) for formal jackets, Shirts to size 19 (54" chest) and trousers to 44" (112cm) waist. Delivery £3.95 regardless of order size. Because Suits Direct are specialist providers of clothes for the plus size male, they can cater for their very specific formal needs. Their site provides excellent customer service for plus size men to 60 inch chest, and 54 inch waist. Free UK shipping for orders over £70 and free returns if needed. Burton (uk) has lots of clothing in XXXL, but don't stock above this. Walktall have everything for the big footed man, including large trainers, big work wear boots, and many other styles of shoes in size 11 – 20. They also have a comprehensive range of clothing for the taller man, as well as fashionable accessories to compliment any style. They supply all types of clothing and footwear up to 70" chest and waist and have size 19 footwear in stock. Clermont Direct Ltd is a leading UK online formal wear retailer. They specialise in selling men's formal clothes at factory outlet prices. Sizes up to 52" chest. Shirts to 19" collar. Their dinner suit packages start at £99 inc Free Delivery.